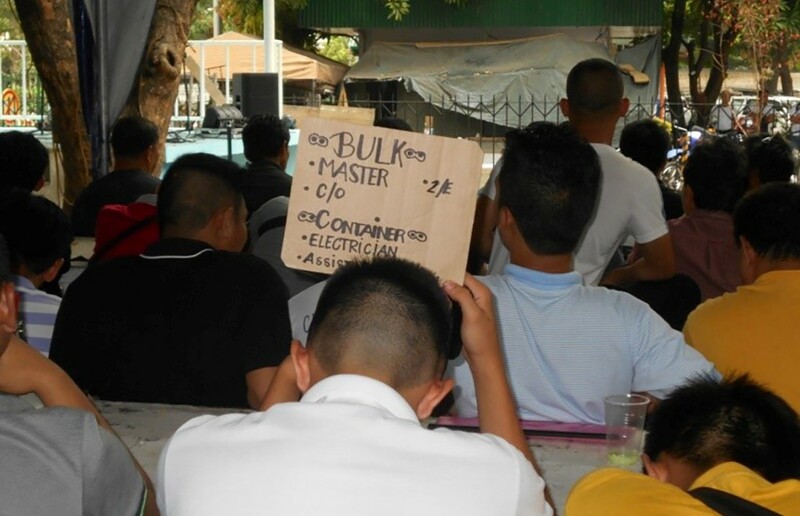 No Smooth Sailing: Philippines ‘Utility Men’, Servitude and Dreams of Better Days. Home /Diaspora, Labour, Philippines/No Smooth Sailing: Philippines ‘Utility Men’, Servitude and Dreams of Better Days. These are the words of 23-year-old utility man, Anton, when speaking about his life chances in the Philippines. He feels stuck and concludes that he can find a better life elsewhere. Anton belongs to what the International Labour Organisation (ILO) describes as the ‘generation at risk,’ or ‘lost generation’ — young people whose economic and social problems have been exacerbated by the Global Financial Crisis. Low wages, persistent youth unemployment, and the general absence of real prospects to improve their lives drive young Filipinos to seek work overseas. 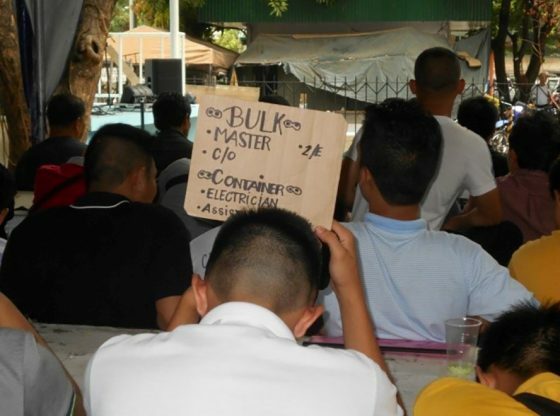 To do so, thousands of young men looking to become seafarers in the global maritime industry serve as unpaid utility men (gofer or flunkey) in Manila’s crewing agencies. These crewing agencies recruit and supply sailors to ship operators around the world. Work as a utility man guarantees a place on a ship. Exploitation and abuse are rife. Despite this, the young men – who possess three or four years of education in either marine transportation or engineering – endure. They do office and janitorial work, recruit seafarers at the informal seamen’s market along Kalaw Street, historically the location of Manila’s major crewing agencies, or perform domestic work—cooking, cleaning, washing and ironing clothes, and looking after children—for their bosses and their families. Some become personal drivers and caretakers of properties owned by their managers. They serve for anywhere between a few months and two years (and sometimes even longer). Crewing agencies ‘waste’ their utility men’s time and efforts. Roger, 24, who drove his crewing manager and fellow utility men to the seamen’s market, was dismissed when he was found dozing off in the vehicle. He begged for ‘forgiveness,’ stopping short of kneeling, to no avail. It took him several months to find another agency to work for. Rafael, 24, who had already worked as a utility man for three months and was due to board his ship soon, said that his service was extended for another six months for the ‘crime’ of pressing all the floor numbers of their building’s lift. His manager, who got on just as Rafael got out, was furious because he had to stop at every floor because of Rafael’s action. The utility men set aside their mistreatment and focus on what the role made possible for them. Their persistence shows strategic calculation. Paradoxically, their servitude somehow eases the feeling they are waiting forever. Because they are doing something, they become hopeful. The utility men saw their jobs as a ticket to a bright future. By transforming servitude into the ability to act, they are able to shape both their present and future. Such a conclusion may seem controversial, but rationality underpins utility men’s decision to endure servitude. Rationality relates to the justification they mount to make it sensible, a source of coherence and direction, rather than internal crisis. Rationality accounts for the bargains they make with their servitude to change the course of their lives. Philippine maritime schools churn out more than 10,000 graduates annually. With few job opportunities, thousands work for free for crewing agencies. Utility men deserve to be treated better. They suggest two measures to do so. First, cap the length of service to a maximum of six months. Second, pay them a minimum daily allowance of 150 pesos (about 4 US dollars). Better regulation of crewing agencies, which have variable practices, is necessary. Ultimately, the Philippine government should step in. Taking the utility men’s suggestions seriously would be a good start. Roderick Galam is a Research Associate at the Institute of Social and Cultural Anthropology, Free University of Berlin. He studies Philippine migration and the social memory of the Marcos dictatorship. 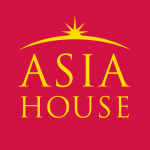 This article forms part of the IAPS Dialogue edition entitled “State and Society in the Philippines.” This article was originally published on New Mandala and can be found here. All images belong to the author unless otherwise stated.